For two pianos, performed as percussion instruments from inside the piano (rather than from the keyboard). In the recorded musical example the pianists are Robert Ashley and Gordon Mumma. The score page is read from left to right, with the time indications in 15 second intervals. The physical placement and approximate time of the sounds are indicated separately for each pianist. The sound resonances result from the dampers being raised throughout the section. The traditional 5-line stave notation at the left side of the page is a connection from the previous section, and is not heard on this recording. For two pianos. There are two recorded examples: the first with pianists Robert Ashley and Gordon Mumma (in a 1962 live performance), the second with pianists David Tudor and Gordon Mumma (from a 1969 recording session). 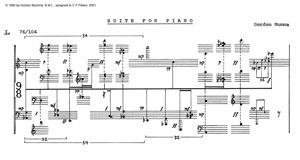 The section # of "x" indicates that the piece can be played anywhere between the other 11 sections of Gestures II, whenever the pianists choose to do so. Conceptually there are 14 "basic" phrases. 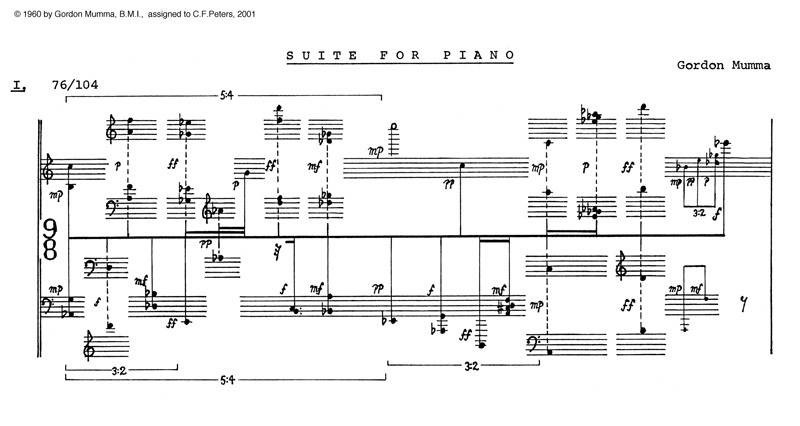 But to complicate the "game" aspect, one pianist may choose to coordinate specific pitches with the other pianist, at the places (in time) where vertical lines in the score connect with pitches on another staff. And as a further "game-level" complication, at that pitch and point in time the pianist may choose to switch from one phrase to another. The solid (black) notes are short and rapidly articulated. The open notes are sustained; the duration is the choice of the performer. Section "x" begins when one of the pianists begins, and the other pianist must then begin. The duration of section "x" is entirely the choice of the pianists: At the end of a phrase one pianist makes a "conclusion gesture" and the other pianist ends with the conclusion of their phrase. If all possibilities of this "phrase switching" with "pitch-time matching" were to be notated in traditional 5-line staves, the score would consume well into 100 pages. and by his slower tempo, Vandewalle allows time for his lovely sonority resonances. .
 Robert Ashley, ONCE Festival premiere, 1961 February. David Tudor, Univ. of Colorado, Boulder, 1968 July. Daan Vandewalle, Hessischen Rundfunk, Frankfurt, Germany 2007 May. 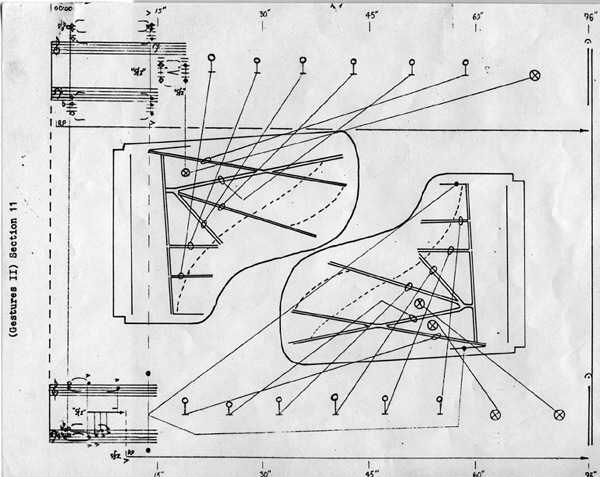 For any number of pianos, MEDIUM SIZE MOGRAPH 1962 is one of seven compositions with the category title of MOGRAPHS. 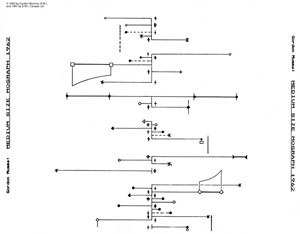 The notation for this MEDIUM SIZE MOGRAPH 1962, on five score-pages, is a unique choreographic format that indicates the physical activities of the pianist(s) but not specified pitch or duration information. 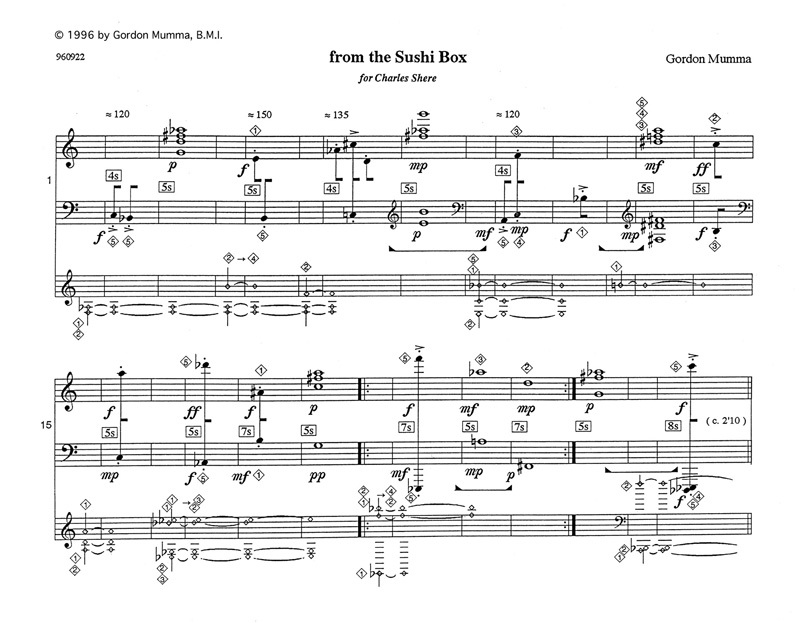 The score pages are read from top to bottom, with the central vertical axis of the score-line placed at the central vertically symmetrical position of the performer. All of the symbols on the score have a vertical symmetry, so that the score-pages can be performed from an inverted position. On this score-age the central vertical axis is separated into eight individual "gestures" of performance activity, two of which are single physical events. 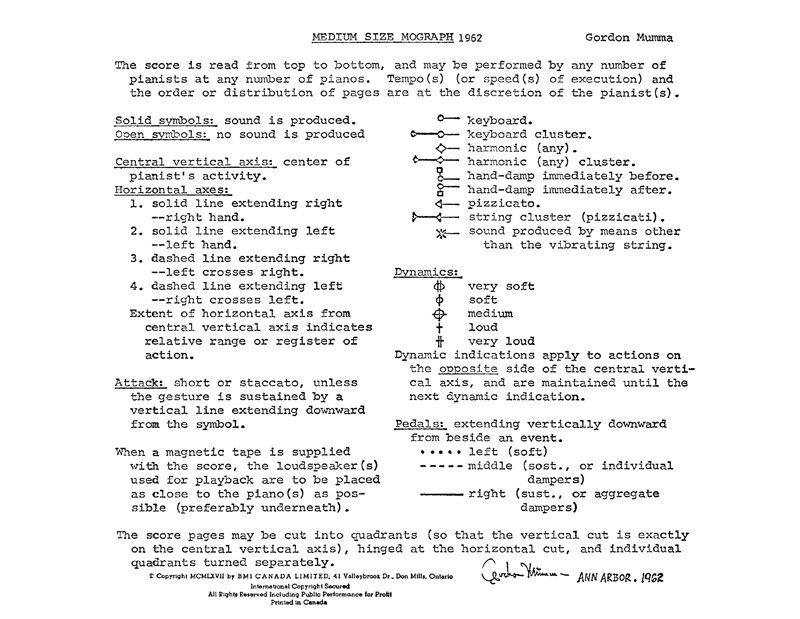 The single score page here includes a second page with specific definitions of the symbols and their performance-practice possibilities. The recorded excerpt is from a 1963 February ONCE Festival concert, performed with two pianos by Robert Ashley and Gordon Mumma. The ELEVEN NOTE PIECES & DECIMAL PASSACAGLIA is a set composed as etudes for the composer's single-manual Flemish harpsichord. Each composition is dedicated to a friend or colleague. 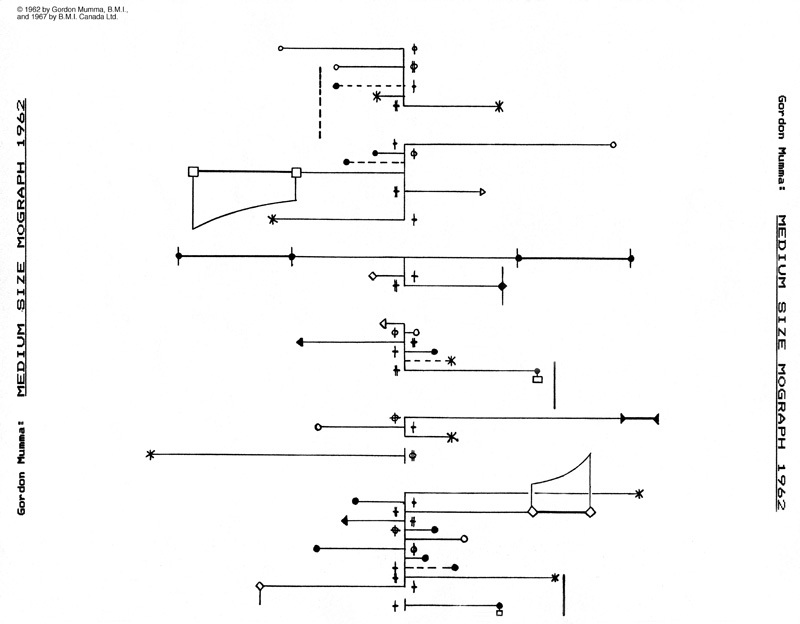 This composition for Pauline Oliveros is a quietly bell-like accumulation of overlapping sonorities. Though the notation is on a standard 5-line staff for each hand, the duration-times for the sounds are not standard. 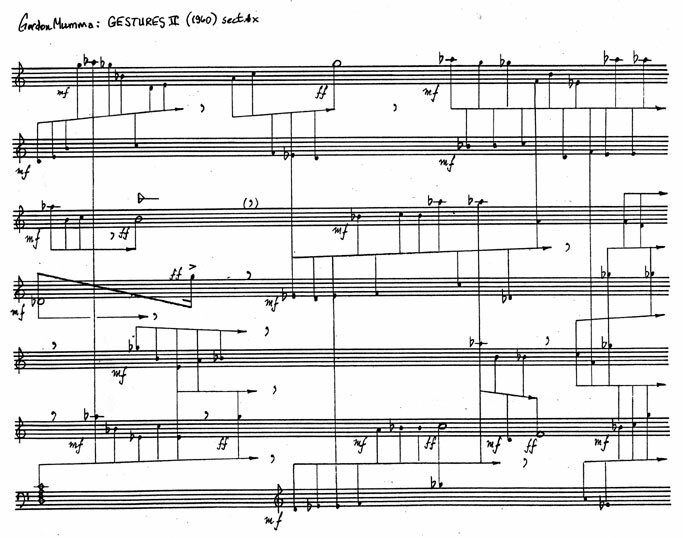 Instead, the endings are indicated by the arrival points of horizontal arrows attached to each note. No specific "tempo" is indicated except for the "slowly, quietly bell-like" instruction. The performer determines the sounding results in the performance venue. One important pedagogical aspect of the "etude" is refining the skill of releasing the keys. rec: 1981 November, Mills College, Oakland, CA. rec: 1992 November, UCSC recital hall, Santa Cruz, CA. rec: 2007 May, Hessischer Rundfunk, Frankfurt, Germany. This score is one of the series 11 SUSHIHORIZONTALS for solo piano. The “horizontal” part of the name refers to the type of page layout. Each of the eleven piano compositions occupies only one page, and has a different musical character and technical performance situation. 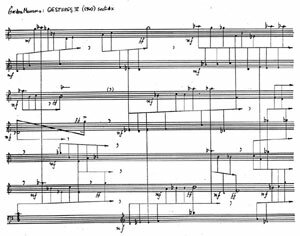 This composition is about resonant sonorities, articulated by punctuating sound attacks with minimal melodic and rhythmic momentum. 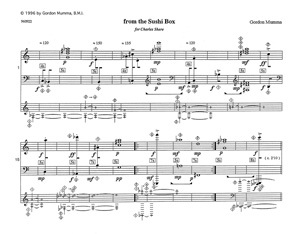 The SUSHIHORIZONTAL for Charles Shere has three staves of music notation. The top two staves are for the sounding notes of the right and left hand; the bottom staff is for the silently pressed (not sounding) and sustained keys for both the left and right hands. The upward stems are for the right hand/ downward stems for the left. The strings of the "silent" notes are composed to resonate specifically with the sounded notes, and thus produces complex but generally quiet sonorities. Throughout most of the score specific fingerings are suggested, to assist with the double-task of sounding and silent piano keys. The solid notes are all brief in attack, allowing for the resulting resonances. Most are single articulations, though in the first part of the composition a tempo marking is indicated for the four multiple articulations. Otherwise, the duration of each of the articulated sounds is indicated in seconds, e.g. "4s" is four seconds. 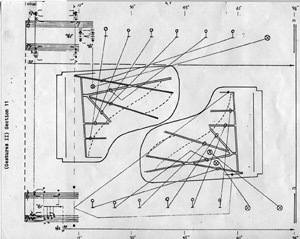 Only four places of this SUSHIHOIZONTAL for Charles Shere have specific indications for the sustaining pedal -- primarily as an aggregate sonority device. No other pedals are used. 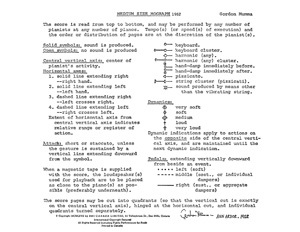 The following two audio examples are from a performance by Gordon Mumma on a Yamaha C7, recorded near and above the piano to achieve a balance between the sounding notes and resonances. Both examples are in a single musical attachment. Example one is the first 10 measures of the score, and example two is the last seven measures of the score; each example is about 30 seconds duration. Complete recorded performances of all the SUSHIHORIZONTALS, by pianist Daan Vandewalle, are in the New World Records 2-CD set of Mumma's solo piano music (NWR/HR2 80686-2).